First of all…I can’t believe it’s August 2nd!! With all the rain we had late spring, early summer, it felt like we were in some kind of time warp that has just suddenly flashed forward! Lots of great things have come my way recently…and I have been quite busy! Been working on a new piece for an upcoming show curated by the amazing and accomplished CJ Pressma entitled Photography since the Millennium which will be exhibited at the Carnegie Center for Art & History in New Albany from October 9th, 2015 – January 9th, 2016. Additionally, my studio space has recently DOUBLED IN SIZE!!! For many years, I have been an Artist in Residence at Highlands Community Campus. In June, a fellow studio mate moved out, making her space available which just so happens to be directly next door! Located in an old church, the upstairs rooms resembled old classrooms with walls that rolled up into the ceiling. This past month that wall came DOWN (! ), and I have spent the past two weeks painting and making it my own. Furthermore, I was recently a guest artist with Studio 2000 and taught a photo transfer workshop at Shawnee Arts and Cultural Center which was super fun and quite successful! I am working on more detailed and individual blog posts about each of the above news…and then some! Stay tuned….I’ve got a lot of posts in the work…and publishing within these next few days. 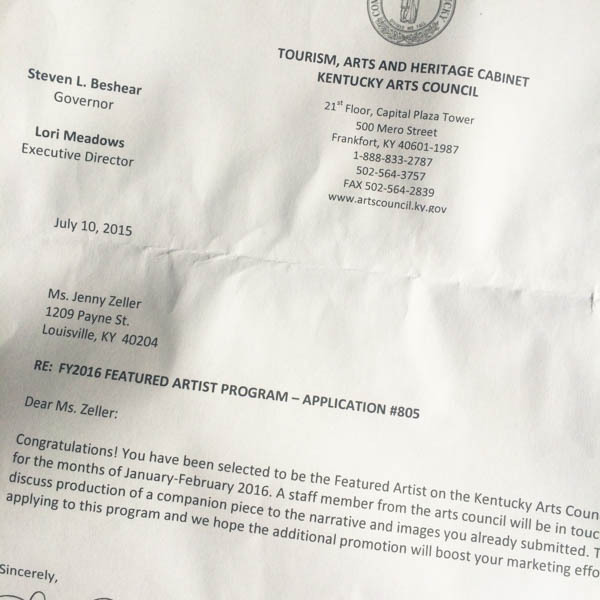 It is my honor to have been selected as a Featured Artist on the Kentucky Arts Council’s website for the months of January-February 2016!!! Somebody from KAC is coming to my (newly expanded!) studio to conduct an interview and create a 7-10 minute video about my work. I’M TOTALLY STOKED! Been so busy, it’s taken me 3 weeks to share such great news!!! !